We’re thrilled to announce that the newest version of Sunbird’s DCIM Operations has just been released. 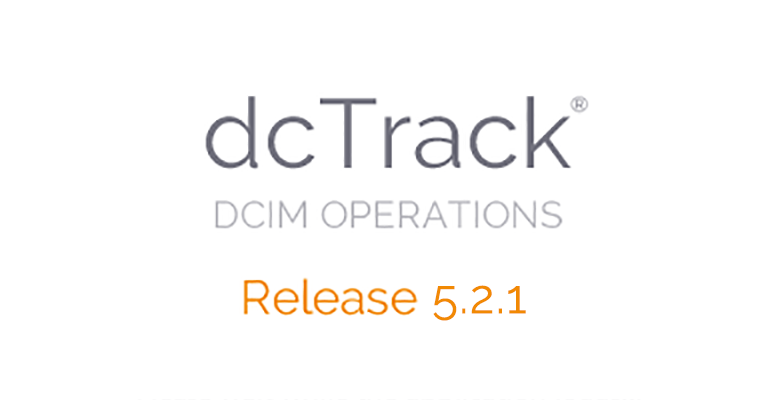 Want to upgrade to dcTrack® 5.2.1 and see what's new for yourself? Simply download the update files from Sunbird’s support portal. This version features API enhancements, fixes for bugs and customer-reported issues, and security updates to provide the most user-friendly, secure web experience to date. See how fast and easy DCIM can be with dcTrack 5.2.1. To provide a more secure web experience, TLS 1.0 is disabled in dcTrack 5.2.1. Transport Layer Security (TLS) is an encryption protocol that provides secure communications over a computer network. TLS 1.0, 1.1 and 1.2 comprise the versions of TLS to date. Due to this change, Microsoft Internet Explorer Versions 10 and below are no longer supported. If you use Internet Explorer, we strongly recommend that you upgrade to Version 11 to ensure compatibility with TLS 1.1 and TLS 1.2.
dcTrack 5.2.1 introduces enhanced REST API support for workflows. You can use the new APIs to manage items, lookups, and requests and work orders. For more information on the enhancements and improvements in this release, see the release notes. To download the upgrade, you will need to have a valid maintenance contract and user login. To create an account, visit the support portal. Your email address and associated company information will be validated.